Reel Monkey Productions worked with specialist media relations agency Mediamark Broadcast and their client BMW on the day of the unveiling of their London 2012 sponsorship providing event and production support. We liaised with broadcast media attending the event and provided broadcast quality video footage for media who could not attend the announcement. 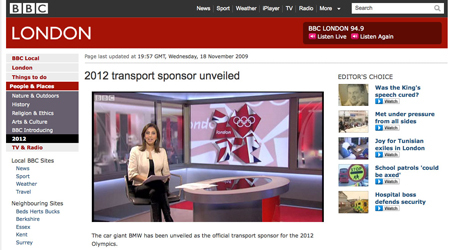 Click on the image below to view the BBC London ‘sponsor unveiled’ report and see some of the footage being featured.